America is blessed with some of the world’s most productive farmland, yet 40% of our food goes uneaten, according to a recent report by the National Resources Defense Council that analyzes food waste from farm to table to landfill. Among that waste, approximately 7% of planted fields are never harvested. With one in six Americans lacking a secure supply of food, how can this be? There are many reasons that crops go unpicked: market prices are too low to justify the costs of harvest labor and transportation, produce is too ripe or doesn’t satisfy cosmetic criteria imposed by retailers, or farmers wind up with more crop than the market demands in a given season. Eight years ago, Marin Organic, an association of Marin County organic farmers dedicated to promoting local and sustainable agriculture, witnessed this problem on a tour of Fresh Run Farm, where visitors saw a field full of unharvested zucchini. Farmer Peter Martinelli explained that he couldn’t sell much of the crop because markets had precise aesthetic standards and wouldn’t purchase squash that was crooked or too big. 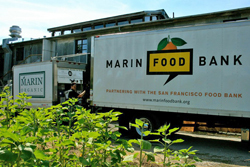 Marin Organic saw an opportunity to both feed and educate their community about organic farming by harvesting the unwanted crops and giving them to food banks and schools. They formed the Glean Team, a group of volunteers interested getting their hands dirty at local farms while donating their time to help those in need. Gleaning—the act of collecting produce or grain left in fields after harvest—has a long history dating back to biblical times. During the Middle Ages, gleaning was widely practiced in Europe and even considered a legal right in some countries. Recently, a modern gleaning movement started to take shape in the United States. 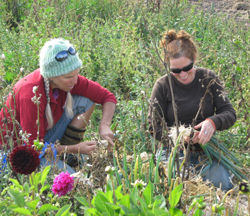 Marin Organic launched the first National Gleaning Day on September 20, 2010, to recognize existing gleaning programs and inspire the creation of new ones across the country. Since starting their Glean Team, Marin Organic has harvested more than 160,000 pounds of produce for local schools and organizations such as the Marin Food Bank. The food bank distributes the gleaned crops to food pantries like the Canal Alliance community center, which serves the mostly low-income immigrant population of San Rafael’s Canal District. Each week, roughly 10,000 children at more than half of the public and private schools in Marin County eat locally grown, organic food donated through the program. Miguel Villarreal, Director of Food and Nutritional Services for Novato Unified School District, describes the relationship between Marin Organic and schools as “a perfect marriage.” In recent years, the program has allowed the district to serve organic produce in their cafeterias on a strapped food budget, but more recently, the district has been distributing the food directly to families to cook at home. Villarreal values the educational opportunities created by the gleaning program, which “connects the three C’s: cafeteria, community, and classroom.” Teachers are incorporating information about organic farming into their lesson plans, while students and parents have become more engaged in learning about the positive health and environmental impacts of home cooking and organic food. Schools throughout the country have contacted Villarreal to learn how to develop similar programs in their communities, and in September he was recognized by the Physicians Committee for Responsible Medicine for innovation in school food service. The foundation of the gleaning program is the generosity of the farmers who donate their crops. Green Gulch Farm in Muir Beach has participated in the Glean Team since the program’s inception, donating about 300 boxes of food per season over the past few years. Farm manager Sarah Tashker says, “It’s a perfect package for us. 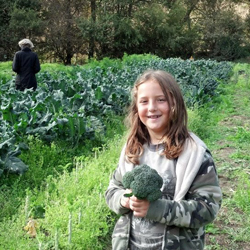 We are feeding many more people, but it’s not economically taxing for us.” Since the farm doesn’t have the capacity to harvest the food and transport it to schools or food banks, she is grateful to Marin Organic for organizing that work. Tashker appreciates how the gleaning program helps people learn about their local food system first-hand. “When people gain deeper and more intimate knowledge of farming, they can better appreciate the people who are growing food and support policies to protect farmland,” she says. Likewise, farmer Warren Weber at Star Route Farms in Bolinas says his farm participates in the program because they “really like the idea of the community knowing more about the farm.” He has observed that Glean Team volunteers have fun and often return, becoming familiar faces in the fields. Green Gulch and Star Route have received no financial benefit for their donations over the years. “We just collect thank-you notes,” says Weber. However, California recently passed AB 152, which provides a tax credit to farmers for 10% of the cost of fresh fruits and vegetables donated to California food banks. Arizona, Oregon, and Colorado have passed similar bills. 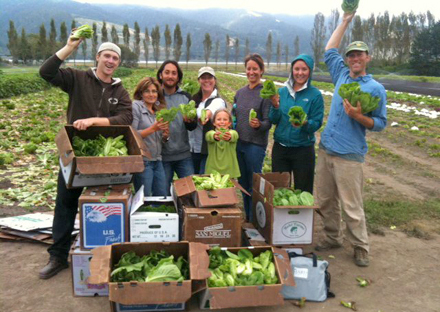 Marin Organic is recruiting volunteers and team leaders for the fall harvest. The Glean Team meets on a different farm every Wednesday afternoon, now until Thanksgiving. There is also an intern program for college and high school students. Visit Marin Organic’s website or contact Kerry McGrath to get involved. All Glean Team photos courtesy of Marin Organic, except for the second photo, which is by Janet McGarry.